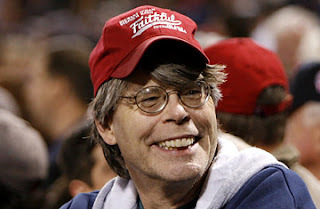 Penny Watson/Nina Roth Borromeo Author: I'm Hangin' With Steve...You Know, Stephen King. 1) I got a kindle for Christmas. Hee hee hee heeeeeee..... I am in love. I will never buy a print book again. My husband gets big-time brownie points for the next decade. 2) Corollary to number 1: Gotta work on my kindle addiction. Sigh. 4) Goals for 2010: Finish/publish Sweet Magik, #2 of the Klaus Brothers Series. Finish Diabolical, my botanical mystery/romance. Travel to a new, exciting place with my family (already have the reservations for Jackson Hole, Wyoming...Yellowstone and Grand Tetons! Yay!). Work on my fitness before August so I can hike the Tetons without requiring oxygen. 5) One more update...I emailed Christine Feehan to ask her when she was writing Skyler and Dimitri's story, and she said...."I don't know"--- Criminy!!!!!!! She is killing me. 6) New books coming up for 2010....Julie Garwood's Sizzle, Christine Feehan's Street Game, A Matter of Class by Mary Balogh, and Fired Up by Jayne Ann Krentz. I can't wait to read these on my new kindle! Weeeee! I hope everyone had a festive holiday season, and that 2010 will bring you exciting and wonderful adventures! So when's your own version of ON WRITING due out now that you play with the big boys like Steve? (Grin) I am so proud of you. Hee hee hee...good one, Michelle! My version of On Writing: use lots of adverbs, who needs conflict?, exclamation points are your friends, don't be shy to use cuss words in romance, etc. etc. I think it will be a bestseller!